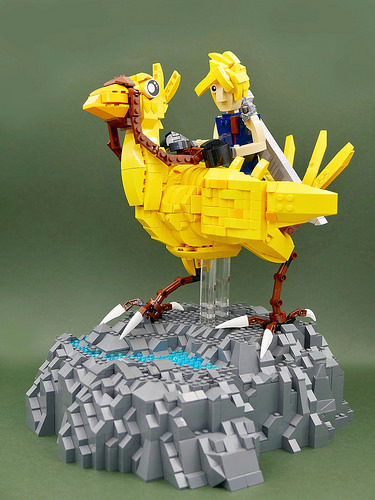 LEGO Cloud Strife and his Chocobo ride into the sunset. When Final Fantasy 7 came out for the PlayStation console in 1997, I spent many, many hours playing it, and one of the most pleasurable aspects, aside from kicking the pixels out of a multi-stage boss in epic 45-minute battles, was riding all over the world on my trusty Chocobo, searching for the elusive Giant Cactuar. This creation by Vincent Kiew captures the game’s protagonist, Cloud Strife, astride his Chocobo in large scale. Vincent managed to make the Chocobo look very light on his feet, which is exactly how they looked and felt in the game. Also, Cloud is very accurate to his on-screen inspiration, down to the large clunky hands, his giant sword slung across his back, and that signature spiky anime hair.